With half of the world's top 10 players and eight of the LPGA Tour's top-10 money winners, the opening event of the 2008 season has plenty of stars to go around. Included in this stellar field is SBS Open defending champion Paula Creamer, whose only win was at this first full-field event of the 2007 campaign. The 21-year-old went on to have another 11 top-10 finishes as she tried to track down Ochoa as the world's top-ranked player. Ochoa, who has had plenty of success at the SBS Open, opted out this week to begin her season at a new event in Singapore at the end of the month. Former world No. 1 Annika Sorenstam -- arguably the best woman player in the history of the game -- is here for the first time since the SBS Open began the LPGA season. Sorenstam usually spends this time enjoying winter sports, but knows if she wants to be No. 1, she has to play in more events. She said she would compete in 18 to 20 this year as she tries to regain her top form after an injury-plagued season. 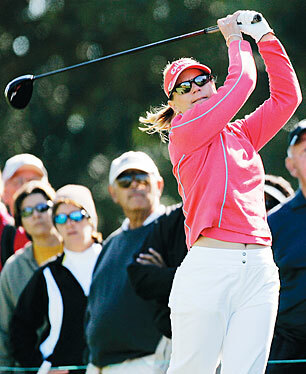 Annika Sorenstam is looking to regain her world No. 1 ranking and will start her quest in the SBS Open at Turtle Bay. Annika Sorenstam opening her 2008 season in Hawaii gives you an idea how serious the world's former No. 1 player is about regaining her title. Instead of snowboarding on some far away mountain, the Swedish star got reacquainted with her golf clubs a little sooner than usual to see if she could track down the absent Lorena Ochoa. The current world No. 1 begins her season in two weeks at a new $2 million tournament in Singapore. That purse almost equals the two first full-field events here in Hawaii combined and gives you an idea how popular the LPGA Tour has become in recent years. Although Ochoa is not here at this week's $1.1 million SBS Open, eight of the top-10 money winners from 2007 did make the long trip, including defending champion Paula Creamer. She finished third on the money list with $1.38 million, trailing only Ochoa ($4.36 million) and Suzann Pettersen ($1.8 million). Her only win in 2007 was here, but Creamer did manage a dozen top-10 finishes, including a second at the CN Canadian Open and a tie for second at the LPGA Corning Classic. The 21-year-old is the top-ranked American golfer and fifth overall behind Ochoa, Pettersen, Karrie Webb and Sorenstam. Pettersen is in the field this week, but Webb opted out after two tournaments in Australia, where she had a first and a fifth. She will play in the new event in Singapore as well. Webb made a run at No. 1 last year, but didn't have as strong a 2007 as '06. She finished 22nd on the money list last year. Sorenstam placed even lower at No. 25 after battling a bad back and neck. The 37-year-old hasn't played in Hawaii since winning the 2002 Takefuji Classic at the Waikoloa Beach Resort. Creamer believes Sorenstam being here proves she's serious about her comeback after going winless for the first time since joining the tour in 1994. "She wants to come out and play well this year, so it isn't surprising at all," Creamer said. "The events in Hawaii are far away, but they are good tournaments. They aren't huge purses, but it's nice when you already have so many weeks off in the offseason to get back and get competitive again." As defending champion, Creamer would like nothing better than to give a repeat performance this week. Her first tournament as a full-fledged tour member was at the 2005 SBS Open, so there are plenty of good memories to draw upon at the Arnold Palmer-designed course at Turtle Bay. Is there any added pressure to being defending champ? "I don't know if it's extra pressure, but people have nerves because we haven't really been competitive for very long," Creamer said. "I think it's just getting used to the routine again. "I always know that when I go to an event I can practice hard and get used to things again and get back out there. So I'm looking forward to defending my title, I really am. Obviously, I won it last year and there's no reason I can't win it again." Creamer closed with a 70 last year to beat Julieta Granada by one shot and Webb by three. Ochoa finished in a tie for fourth with Janice Moodie and American Morgan Pressel. Moodie and Pressel return in hopes of doing even better this year. Past SBS Open champ Jennifer Rosales (2005) is in the field, but Joo Mi Kim (2006) is not. Pressel is coming off a stellar season in which she won at the Kraft Nabisco Championship after Pettersen melted down the stretch. Pressel became the youngest player ever to win a major. Two of her seven top-10 finishes were here. After tying for fourth at the 2007 SBS Open, she tied for third at the Fields Open, which will be played next week at Ko Olina. Last year: Paula Creamer , left, won the season-opening tournament for her first victory since 2005, holing a long birdie putt on the 17th hole to beat Julieta Granada by a stroke. Creamer also won the Tournament of Champions in November.